The minute steak that we get in our CSA has always presented a bit of a challenge for me. Minute steak, as I have learned, is not cube steak. Well, not always. It’s pretty confusing, actually, when you start searching for minute steak cooking ideas. Most sources that I have seen say that minute steak and cube steak are basically the same thing. However, there seem to exist regional distinctions: in some parts of the country minute steak and cube steak refer to the same cut, whereas in other parts of the country, they are quite different from one another. From what I can gather, cube steak is a cut of top round or top sirloin that has been run through an electric cube steak machine. The “cubing” refers to the kind of cross-hatched pattern that appears on the surface after the meat has been tenderized. It literally looks like it is made up of little cubes. Minute steak, on the other hand, is very thin slices of steak that are stacked, formed and shaped into a steak shape. Minute steaks, like cube steaks, cook very quickly — hence the name and the confusion. One of the best things about having a meat CSA is learning how to cook different cuts that I would have never tried on my own. Minute steak is one of these. You could probably just throw it in a pan and be done with it, but I have found that figuring out the right cooking method with the right cut of meat can turn a perfectly good meal into something downright spectacular. 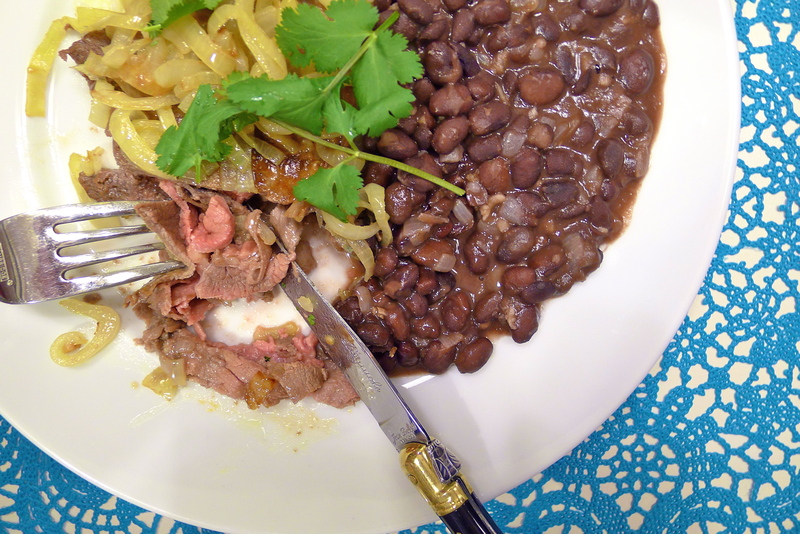 Bistec de palomilla with Cuban black beans and white rice is one of those meals that is so simple that hardly anyone bothers, as Tomoko would say, to write it down. People do write it down, of course. On the web, you can easily find many recipes for it, including this one from the New York Times that I used as the base for the one below. In all honesty, I could have chosen any recipe for bistec de palomilla since they are all almost identical. Sure, I was tempted to put my own wacky spin on it, but sometimes good things are so good that you just have to leave them alone. The essentials are that you marinate thin cuts of beef in garlic and lime juice (it doesn’t necessarily have to be minute steak or cube steaks, just thin steaks), you cook rice with lime juice and garlic, you cook the beans with lime juice, garlic and onions, and finally you sear the beef and top it with sautéed onions. But just because it is simple doesn’t mean it that doesn’t taste divine. So if you like lots of limes and lots of garlic, this recipe is for you! * If you love limes and garlic but not the meat so much, the black beans and rice are easy to make and absolutely fabulous on their own. I used canned beans here because that is what I had in the pantry, but if you prefer dried beans (and who doesn’t), by all means soak ’em and cook ’em! 1. Lightly sprinkle the steaks with salt and pepper (because the limes are so punchy, you can reduce the salt without sacrificing flavor). In a large zip-loc bag, combine the lime juice, the garlic and the meat. Toss everything together in the bag until the steaks are evenly coated with the garlic and the lime juice. Let the steaks marinate for about 45 minutes, but do not marinate them for more than an hour. 2. While the steaks are marinating, make the rice and the beans. In a medium-sized saucepan, bring the rice (you don’t need to rinse it), the 3 cups of water or chicken stock, the lime juice, the garlic and the olive oil to a boil over medium-high heat. Turn the heat down to low. Simmer the rice until it is tender and all the water has been absorbed — about 15-20 minutes. Remove the rice from the heat and fluff it with a fork. Cover it while you prepare the rest of the meal. 3. In another medium-sized saucepan, heat some olive oil over medium-high heat until it begins to shimmer. Sauté the chopped onion in the olive oil until it begins to turn translucent — about 5 to 6 minutes. If the onions seem to be cooking too quickly, lower the heat to medium. Add the finely minced garlic. Continue to sauté everything together for about another minute or so. Add the beans (you don’t need to drain them) and the lime juice. Stir everything together and simmer the beans over medium/medium-low heat until the cooking liquid has thickened. The beans should be tender at this point. Adjust the seasoning. 4. Heat 2 tablespoons of olive oil in a large cast-iron skillet set over medium-high heat. When the oil begins to shimmer, add the sliced onion. Sauté the onion until it just begins to turn translucent and take on a little bit of color. Remove the onions to a separate bowl or plate. Lift the steaks out of the marinade and add them to the skillet. Cook them for about 2 minutes per side (they will cook even more quickly if the steaks are really thin). Remove the steaks to a large plate or platter. Add the sautéed sliced onions back to the pan to let them soak up all those nice, meaty, lime-scented juices. Heap the onions on top of the steaks. Top everything with sprigs of fresh cilantro. Serve the steaks with heaping scoop of white rice and another of black beans. That is totally one of the things I like about having a CSA: getting to know and prepare new foods different ways. Also, the quality! I haven’t done a meat CSA but the fruit and veggies we get in our boxes are the best. I agree: everything is always better straight from the farm! I love having a CSA too. I have wanted to do a veggie CSA for years, but I fear that I will be just completely overwhelmed with greens (I hate throwing things out) since it’s just me, really. If I had to feed a family, I would totally do it in a heartbeat! Thanks, Kay! It was so yummy. And it was actually amazing as leftovers too! Happy to have found your blog and enjoyed reading your posts. Your recipes reminds me of all the meals I have had in Cuban restaurants when I lived in Miami. There the minute steak was just one thin piece of meat…and if not for the marinade would have been a little tough. Yours looks perfectly cooked and tender. It was super tender and delicious! I would love to eat my way through Miami. I bet you had some amazing Cuban food! Thanks for the comment and thanks for dropping by! Now this looks delicicous – I can remember a friend calling it minute steak but as in ‘very small’ because he thought that was what it meant! Funny! A minute steak. They must have been tiny! Love the black beans and rice. They were so good. Next time, I will make double the amount of rice and beans so I have more the next day! I grew up on frozen Minute Steaks and SPAM. Minute steaks are so quick, easy, and tasty you just HAVE to love them. And black beans are my “new favorite thing”. Seriously. Love ’em! They are so delicious, so filling, and so versatile. I now consider black beans a “must have” in my pantry. The recipe looks incredible! Can’t wait to try it! Minute steaks are growing on me. This recipe definitely got me excited to start trying other things with them; they are really super quick, easy, and tasty! And I love black beans too. I love all beans, actually. Me and good ol’ Phaseolus vulgaris, we go way back! This is exactly the kind of food I *love* to cook and eat. I love that you belong to a meat CSA, and I love that you wound up cooking minute steaks! (I haven’t thought of those literally since I was a child.) TASTY. I love being a part of a CSA. It is really one of the best things that I have ever done. I love being involved with the farmers and learning about where my food comes from. And I love eating what we get. I am seriously spoiled for any other meat now. Minute steaks are pretty awesome. I never realized how many people had them as kids until the CSA! Rice and beans with scrambled eggs sounds so good right now! I will have to try that. Yum!